Hot on the heels of 2015’s vinyl debut of the live 1981 Snakefinger concert in Melbourne, comes another rarity finally seeing the phonograph light of day, thanks to Madison’s Secret Records. 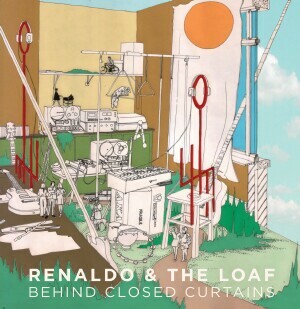 This time around, we are treated to the elusive, unreleased first album, by U.K. avant gardists, Renaldo And The Loaf. Perhaps best known for their work on the Ralph Records label in the early 1980s, the creative forces of Brian Poole (“Renaldo”) and David Janssen (“Ted the Loaf”) are characterized by a desire to make synthesizer-type sounds by unconventional means. Often this meant tape loops and tape manipulation, back when that particular medium was still in its infancy. ‘Behind Closed Curtains’ was recorded in 1978, and was intended for release the following year under the band moniker Plimsollline. Shortly after, the group changed their name, and was picked up by the Ralph label after The Residents listened to a cassette dropped off at the San Francisco Ralph headquarters. Indeed, Residents weirdo attitude abounds here, in close proximity to a dreamlike style reminiscent of the ambient Eno albums. Or, you could say this music teleports you to the astral/aural equivalent of the Pee Wee’s Playhouse soundscape.